Lorna is struck by lighting. You’re kidding, right? My taste in hats has been somewhat controversial ever since that fateful day. What's her excuse? The National Weather Service estimates that the odds of being struck by lighting in any given year are 1 in 1,000,000. For those of you who didn’t already know it, I’m a one-in-a-million-kind-of-a-gal. Only about 10% of people hit by lightning die, so I’d been super special if I’d died. I’m not that special. I should’ve had some extra protection given that men are 5 times more likely than women to attract lightning. Scientists insist this has nothing to do with testosterone and everything to do with their propensity to be on top of things and storm-chasing. Personally, I don’t see the difference. I was taking Scrappy for a walk along a tree-lined dirt road that followed a babbling Adirondack brook. Since I had no radio or TV to give me forecasts, I relied on “Eyewitness Weather.” I looked at the sky and all seemed clear. I planned to walk Scrappy then stop by the local library. Driving to a nice spot along the road, I parked and let Scrappy romp. The trees obscured the sun, or so I thought. They were luscious trees providing abundant shade. We were about 2-tenths of a mile from the car when I felt a big splat hit my head. I was sure some bird did the dirty on its flight path. Then I noticed more splats all around me: rain with attitude. I looked through the canopy of trees and saw charcoal where blue should have been. Scrappy, being a fast, smart dog, ran back to the car. 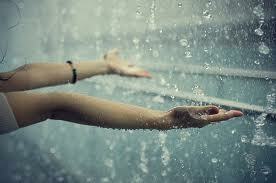 I stood there thinking about gentle summer rain on my face—a great Gratitude Journal entry for later. When the clouds released Niagara Falls on me, I figured it was time to make like Scrappy and get the pup out of there. Unless you count the time I fell into a lake fully clothed, I’d never been so thoroughly drenched so quickly. Just as a turned to go back, two of my senses were simultaneously assaulted—common sense not being one of them. I heard an ear-splitting CRACK! and, over my left shoulder, I saw a blinding spray of light. I ran to the car. Soggy Doggie and Drenched Driver got in and slowly made our way to the library. By then, the rains stopped and blue ruled the skies. I made quick work of my business at the library, feeling self-conscious in my squish-squashing sneakers and looking like I just came from a “Wet-Tee-Shirt” contest. See how embarrassing this look is? Upon returning to my sister and brother-in-law’s lodge, I laid down to read. Two hours later I woke up. Napping is highly unusual for me. Scrappy had his nose about two inches from mine. It was an hour past his dinner time. I tried to get up and noticed that my legs didn’t want to follow suit. They felt like dead weights. My arms did, too. Apparently, I woke up but my body didn’t. Ever so slowly I was able to cajole by extremities to move so I could feed Scrappy. I looked like a barely animated zombie, without the flesh-lust (I’m vegan). I laid back on the couch and fell back to sleep. When I woke up after another hour, I knew something was wrong. Two naps in one afternoon? Why this abnormal behavior? I hadn’t eaten much that day, but that was typical. I tried to get up to get something to eat but that felt like too much work. Scrappy knew a few tricks, but “Fetch the cashews” wasn’t one of them, so he wasn’t any help. Must. Change. Into. Something. More. Comfortable. Boots. Killing. Me. The only other odd thing that day was our walk. Lightning? Could it be? I did what I always did when I needed answers; I called Tina, my older sister. Jim, my brother-in-law, answered. “Jim? Iz me. Lor..na.” I was loopy groggy. “K. Jim. Iz me.” I hung up and fell back to sleep until the phone ringing woke me back up. It was Tina. “Yup.” I started dialing with a heavy finger while she was on the phone and heard her call my name. Yup. No prolem. Sir, um, Teen. Iz me. Um fine. Yeah, it was…after the fact! Holy Tamales …. Scrappy is one smart pooch. He got outta Dodge real quick. Bet he could sense what was a coming. Dang .. what next …??? 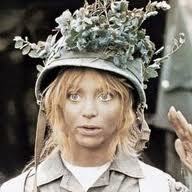 You turned into Private Benjamin?! Lorna, you are blasting through karma at the speed of light (ning), girl!! This kind of thing could only happen to me. My medical records are as thick as War and Peace! Scary. Of all people and all your prior health issues, lightning had to strike you. Good grief. I’m gonna have to start calling you Charlie Brown. Dang girl! Can’t wait to read the rest of the story, but DANG! I am glad you made it through all this … I hope OK.
Ahhhhh…..rest of the story! I want the rest of the story! OMG!!! that sounds horrible. Although sorry to say that convo was a little funny if you think about it. But glad you are great enough to be here today and tell us your wonderful story. Even though it is on a cliff hanger. No way. Lorna, the hell with the book. Your life story needs to go straight to a made-for-TV movie! Most people could stand out in the middle of a thunder storm every day of their life and never come close. Not our Lorna! Wait a minute, you weren’t wearing that hat in picture # 1 that day were you? I hate to laugh at bad things that happen to good people, but that last picture…. !